This project was part of a much larger project (Office365 Application also included this portfolio). 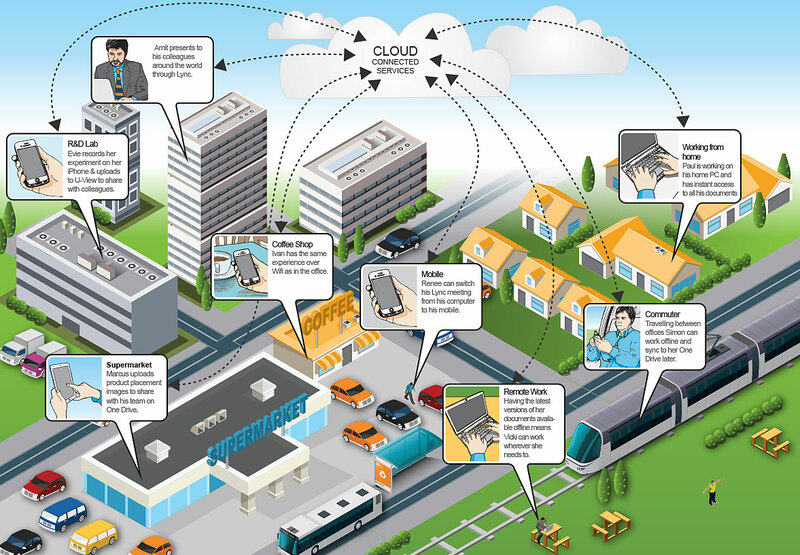 The intention was to develop an info graphic that would communicate at-a-glance the potential for the new “cloud-connected-services” and devices being rolled-out by this multinational company. Very early on the project stakeholders were keen on a 3d type illustration that showed the new technology being used by different role users, in different locations (distributed offices, manufacturing plants, partner offices, remote work locations, commuting and at home) . The requirements evolved rapidly. At the start of the project not all the requirements were known. For this reason I decided to concentrate on creating individual 3D elements in isometric projection (rather than full 3d with perspective) to enable me to position an element anywhere in the scene without worrying about perspective and scale. I created initial sketches of: offices, people, cars, trains, houses using isometric graph paper that I had created for this project. The stakeholders approved the concept sketches and the final illustration (using Adobe Illustrator & Poser for 3d figures) evolved through several iterations before final approval and output for web and print publishing. The stakeholders communicated the project goals were met very successfully and that a single info graphic visually communicated the full scope of the much larger Office365 Programme.